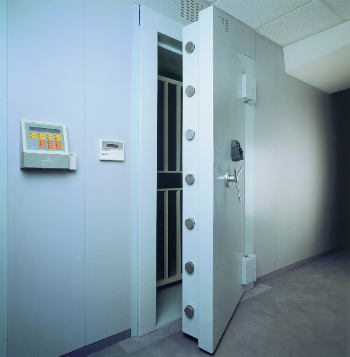 This bespoke Modular Vault from Secuirkey has been designed and built to ensure optimum protection against unauthorised entry to your home or commercial premise. The Modulprim can be built as a four or five walled (including the ceiling) security solution. Ideal for both new and existing buildings the Modulprim is easy to install due to multiple panels that are prefabricated off-site to preciselt fit a detailed floor plan. This means that vaults can be fitted to suit most room situations as well as allowing for modification possibilities at a later stage if necessary. All of the Modulprim vaults undergo extreme rigorous testing to meet European Security Standard EN1143-1 – a global control and certidication standard. Furthermore gradings from 0-9 are offered so that you can select the ultimate solution for your requirements. If you require the highest level of security to protect high value assets against theft, fire and explosion call one of our security specialists on 0117 9674994 for additional advice and information. We also provide a free delivery service to all sites at an address on the UK Mainland, or contact us for a quote to have our qualified engineers fully install your safe.